The stormy weather couldn't wash away the dedication of Pittsburgh litter fighters, who gathered throughout the city and surrounding counties to help redd up their communities. We're collecting neighborhood reports and assembling them here. Please let us know how your event turned out! And don't miss our ever-growing collection of photos from the Redd Up events! Neighbors gathered at Cannon Coffee and spread out throughout the neighborhood to gather over two dozen bags of litter. Pictures and more coverage are available on the Dormont-Brookline Patch. Despite the heavy rain and shortened clean-up we managed to salvage our Earth Day Clean-up event. Sixteen volunteers collected about 40 large bags of trash and four 30 gallon bags of recyclables in 1.5 hours. City Park's Michelle Underwood organized kids to clean Brookline and Moore Parks and collected many bags of trash as well. This year we sponsored afterward a hands-on seed planting demonstration for kids and Phipps Conservatory master gardener Lorrie Eusades did an hour long presentation on container gardening, which was a big hit. City of Pittsburgh urban forester Lisa Ceoffe stopped by with Tree Pittsburgh information and also updated us on the status of new shade trees for the boulevard renovation. She has been very helpful shepherding this process and helping to make sure we will have a beautiful and green boulevard. Four people are slated to take the Tree Tenders course this summer and it looks like a 5th person is on board. Antonio's Pizzeria has supported our efforts for several years by providing a pizza lunch for the kids at Brookline Park and for the adult volunteers. Tony is a great Pittsburgher and runs a community oriented business! If you are in Brookline, stop in. His food is excellent and he runs the cleanest shop I have ever seen. Cannon Coffee has acted as the home base for Earth Day and other clean-ups since opening in early 2010. Having a business that offers a can-do attitude toward providing a community culture hub has incubated many positive things and is an immeasurable asset. Cannon was able to link Burg Bees with South Pittsburgh Development Corporation and now we are working on using the 1.4 acre Jacob/Whithed parcel as an apiary site. And finally I would like to thank Myrna Newman of Allegheny Clean Ways and Sara Alessio Shey of PRC for supplies and assistance over the years. See the Dormont-Brookline Patch for event photos and coverage. Larimer Clean-Up, Redd Up Day began on April 16, 2011. Prior to the event day, we began to encourage participation from residents, local churches, schools, private organizations and interested parties from other neighborhoods. We were able to gain support from Lincoln Academy?s Parent Group and the use of the school parking lot. The adjacent church also granted permission to use their bathroom facilities, along with another church located two blocks away. The Courier newspaper announced Larimer Clean up Day as well. Despite the rainy forecast numerous people came. The youth group from a local church came with orange vest, rakes, gloves, shovels and some had their own gloves. They worked diligently bagging one hundred fifty (150) bags of trash from vacant lots and streets. The drizzle did not stop the workers. They continued to bag. However, the rain began fall rather steadily, causing all of us to retreat and seek shelter. We definitely thank all participants as well as supporters such as Boris Weinstein, Citizens Against Litter, who provides us constantly with direction and guidance and Patty Chavez, City of Pittsburgh for as always responding quickly and efficiently. Because of the rain commitment was made by participants to return next Saturday, April 23, 2011 to continue the Clean Up-Redd Up Project. We expect to have an even better turn out. Over 60 volunteers collected several hundred bags of trash, as well as numerous piles of large debris. Visit our Spring 2011 Redd Up photo album to see more photos of this, and other, cleanups! 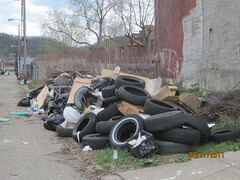 Do you know who cleaned up Allegheny River Blvd [on] Saturday April 30th? It must have been a massive effort! We were coming home from a trip Saturday evening and saw tons of trash bundled and ready for pick up. I would like help with that specific cleanup next time. It is such a pretty drive along the river. First off, thank you to everyone who participated in the Squirrel Hill spring clean-up on Sunday, April 10th. We could not have done it without your help. The weather once again favored us with a summery day, and the amount of garbage and recyclables that we collected was impressive indeed. Many of you have indicated that you're interested in becoming regular clean-up stewards on your street or in your area. Doing so requires little more than a bit of personal time spent on the street with a spare trash bag and an able pair of hands, but if you're interested in obtaining tools to aid you in your efforts, or if you're looking for suggestions or even for someone to help you, please contact Bicky Goldszer. We would love to see our volunteers in action, so please feel free to document your street pick-up experiences and send us your stories or photos!